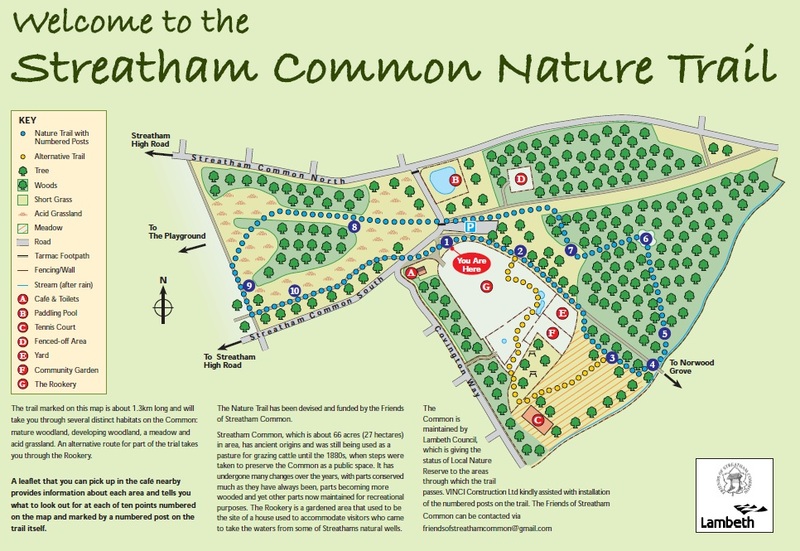 The Nature Trail, devised and funded by the Friends of Streatham Common, was opened on 23rd March 2013 and the accompanying self-guiding leaflet can be picked up in theRookery café. The trail helps make sure that Streatham Common’s relatively rich wildlife is not passed by. The trail passes through three distinct habitats. One is the last remaining meadow in Lambeth, the sloping grassland above the tennis court and still known as Hilly Four Acres, the name it had when part of a farm. Another is the woodland right at the top of the Common, the largest wood in Lambeth. The third is the area of ‘acid grassland’ between Streatham Common North and South. Each area suits certain flora and fauna better than others. The Nature Trail’s leaflet provides some detail. Click here to view the Nature Trail Map. The leaflet, which is available from the Rookery café, has a map of the trail, shows the position of ten numbered wooden posts that are to be found on the trail and gives a little information about what you should look out for at each post. What you might see in practice depends a lot on the time of the year. The areas through which the trail passes have very recently been designated as a Local Nature Reserve by Lambeth Council, which ensures both that they are more protected than before and that they will be managed in a way that promotes biodiversity. The Friends, who funded the Nature Trail, hope that it will draw attention to the relatively rich wildlife on the Common and provide educational opportunities. We would like to thank VINCI Construction and Mitchellson Formwork and Civil Engineering, two companies that are helping build the new ice rink, swimming pool, supermarket, etc on ‘The Hub’ site, for installing the information board and posts on the trail.